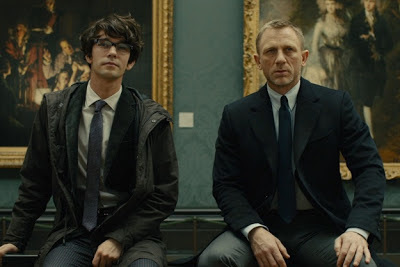 We're movie lovers here at Casa Painter, and Anglophiles, too, so of course we caught "Skyfall" on opening weekend. Did you see it? If so, you probably saw Gomery, or rather the character of Q looking highly Gomery-esque. This guy's a cutie. His anorak kind of makes the outfit. Though in England I think it's called a windcheater. Kelly, is that correct? Btw it works again!!! I can comment as me!! That is DEFINITELY how I see Gomery. Except his sleeves should be rolled up. I also enjoy seeing what the author thinks the character looks like, or at least a close approximation;) Keep 'em coming. That is a very cute Gomery, I approve! I might have imagined the hair a bit shorter but I don't really visualize characters like this, the face and hair are usually a bit blurry in my head. I'm with the others as well, it's interesting to see what you think how they look like. oh darn it! I was going to see this movie last weekend and got too busy/distracted. I could have used a Gomery sighting. I think he's a good approximation - even the setting is appropriate - but I agree with Chiara that the hair is too unkempt. This conversation is making me smile. If you guys are ever reminded of anyone in the stories, send me a pic and I'll post it. Bess and Chiara, maybe this is Gomery's hair when he wakes up to answer the motel's nightbell. No, I'm curious. Weigh in if you feel like it. I'm not as opposed to chest hair as I used to be but I am opposed to men covered in fur unless they are the Beast. I did not expect to weigh in on chest hair opinions when I woke up this morning. This is why this blog is always so delightful lol! Also hoping that this does not live forever on the internet but i am not opposed to chest hair at all. I am more opposed to extensive waxing. If you were gifted with some chest fur, embrace it. Laughing, loving it, hooray! This conversation can continue forever, in my book. Too entertaining. The guy Fair hugs -- re: the stomach medicine -- at the end of "Redwoodian" was definitely of the fur torso family. I like how The Beast worked into the discussion, too. I was super slow in getting round to seeing Skyfall, just saw it yesterday. Everyone was telling me how cute Q was, but I didnt believe them because Ben Whishaw was so creepy in that Perfume film. I was very glad to be proved wrong as he was indeed very cute and Gomery-esque! Yep that kind of coat is called a windcheater here, although you could also say anorak, either works. Weighing in on the chest hair issue (not a sentence I imagined I'd be typing!) - I am totally in favour of a little chest hair, but absolutely agree with Erika that a full fur sweater is a step too far. I think back hair is where I draw the line! Kelly: Thanks for the final word on windcheater. It's a great term. I also prefer "trainers" to "sneakers," too, for what it is worth. I'm not familiar with the perfume movie (and I dare call myself a movie lover). Wait. Dustin Hoffman? Ha! Okay. Chest hair. I'm actually asking for a reason. Yes, we try and keep it classy and semi-high-minded around the Wilfair blog -- discussions on writing techniques and favorite songs and such -- but once and awhile topics of a more, um, warm-blooded nature work their way in, somehow. I like it. I can't talk about snoods and Ferris wheels and cheese dip all the time! Yep Dustin Hoffman! Looked it up as I couldnt remeber the full name, and its "Perfume: The Story of a Murderer" Ben Whishaw is the main guy, but he looks so different! I am a total wuss about scary films, got talked into watching it, and found it really creepy. Haha I think the odd warm-blooded topic of discussion is essential, no one can be classy and high-minded all the time! Completely missed the chest hair discussion, I'm with Erika and Kelly, full fur sweater is too much but waxing is a no no as well! On a random note, "windcheater" has to be one of the most adorable words I've heard in a while, cheating the wind...love it!